don't know how this was calculated with JB at #2 but congrats. Reminiscing about life with smokey eyes. I changed it so that you can keep me on your mind. 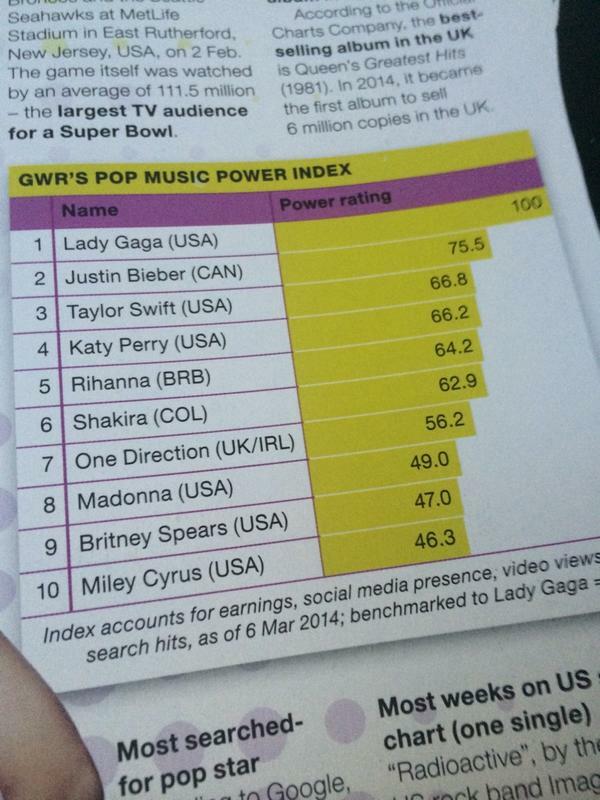 But 8 of the acts below her (bar Shakira) are more popular than her. So um. you mean biggest since Britneymania? I agreed Gaga's The Fame/The Fame Monster time was really one of the few biggest eras from females artist! Britney and Madonna would be much much higher if there was social media in their peaks moments. Britney was easily the biggest popstar since Madonna, her whole peak was flawless, after scoring the biggest female debut of all time with "Baby one more time" she broke records again with "Oops I did it again" and had 2 back to back Diamonds albums, she ruled the world, the Britneymania back then was way stronger and bigger than the ones we see today, and IMO she was the last huge popstar that was produced in the business. Gaga, had a huge debut that required re-releases / Re-editions to force sales, and her peak was short lived, by the time "Born this way" arrived it wasn't at all an "Oops I did it again". everyone had the album bomt. Why buying singles? When its all said and done tfm sales are much imressive for the time it was released, imagine if it was released in 1999 with smashes like jd, pf, lg, papa, maybe over 30.000.000? ^ Oops I did it again received sligthly better critical reception than Born this way and had more memorable hits around the globe as well. As well as huge pop impact. However, we're not talking about the quality of the albums, we're just talking about peaks. Anything after Britney can rival to her huge peak. PS: I'm thankful Beyoncé's not on this unworthy list. Gaga's era bigger, she sold less only in us, had bigger hits from one first album, also amazing sales for singles when in 1999 if people liked few singles they would probably buy album and that's why single sales were low overall , Gaga also recieved grammies etc. @Hugo I agree , 5 years after her debut Britney was getting huge acclaimed hits with "Toxic" and "Everytime" , Gaga was releasing fiascos like "Do what U want" and "G.U.Y"
Even Gaga herself knows that Britney was bigger than her in ALL aspects. EDIT: Not appropriate for UKMIX. Although, I still think ARTPOP is not as bad as its reputation suggests, and would take it over any Britney album (or the very popular The Fame for that matter). But oh well. If Gaga had handled the era normally (like she started with Applause, before the DWUW/label shite), the success would have been bigger and everyone would be raving about how great the album is. How do we even know if this list is legit? I ask because it just look like someone took a picture of something. "This list is a flop, unworthy, joke"
How unworthy is it now. Did you check the link I posted in the OP? Several pictures have been posted of this list and that guy is a record holder and got an advance copy. I thought it was fake too. It literally looks like something from 2010.